Our first issue. Probably not collectible, but valuable just the same. Welcome to our first issue of “Hot Off the Grill,” the official Dos Coyotes newsletter! We’re still working out the kinks, but, as promised when you first signed up, we’ll keep it fun, informative and hopefully provide enough value so you look forward to seeing it in your in-box (which — don’t worry — won’t be too often). We hope you like the newsletter (let me know what you think! ), and be sure to tell your family, friends and table-mates to sign-up to for their own copy. We’ve got a ton of big Dos news for the inaugural edition of “Hot Off the Grill,” including my new favorite seasonal special (the asparagus quesadilla — available at all locations and well worth the trip), info on our shiny new website and the kick off for our kinda annual, semi-occasional poster contest! We’re really blowing the doors off for the 2013 poster contest, with more than $2,500 in prizes, fan voting on our Facebook page (win prizes, even if you’re not an artist!) and support for a local high school art department. Thanks for supporting Dos Coyotes. Have you had your dos today? 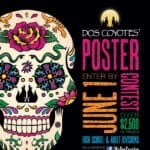 Win Fame, Fortune and Beaucoup Burritos in the Dos Coyotes Poster Contest! Combine your love for Dos Coyotes with your creativity for the chance to win a $500 Dos gift card in our kinda annual, semi-occasional Poster Contest! Paints, pastels, Photoshop… Give us your best work and your entry could end up as a Dos T-Shirt, menu art or napkin (that’s the “fame” part)! And you don’t have to be an artist to win. This year we’re posting our top entries on the Dos Coyotes Facebook page so all of you can vote for your favorites (and possibly win a Dos gift card!). More than $2,500 in prizes! Start planning your poster concept today, or at least tell your artsy friends (who can treat you to a Ranchero Burrito when they win!). Look for the best entries see your local Dos and on our Facebook page in early June. 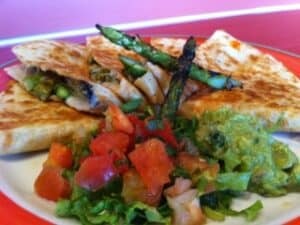 Seasonal Special Spotlight: The Asparagus Quesadilla! But the true star of the dish is another locally sourced delicacy — the cheese. We’ve found a local cheesemaker, Sierra Nevada Cheese Company, who’s providing us with a raw milk jalapeño jack that is insanely delicious. It’s rich, creamy, spicy, and provides a perfect counterpoint to the asparagus. The incredible taste isn’t the only reason we’re excited about this cheese. Sierra Nevada Cheese Company purchases fresh organic milk from local dairies, so with every bite, you’re enjoying (and supporting) responsible, sustainable agriculture. By using raw milk, they showcase the complex flavor profile of the cheese while preserving the full nutritional value. If you want to learn more about Sierra Nevada Cheese Company, check out their website. We’ll only be offering the asparagus quesadilla for a limited time, so swing by Dos and give it a try. Even if you’re a dedicated carnivore, this quesadilla packs a punch that will put that commitment to the test (or you could share it with a friend and enjoy one of our legendary Southwest Chicken Burritos as well!). If you haven’t been by the Dos Coyotes website lately, check out our redesign! Just like our restaurants (and food, for that matter), the new site is colorful, fun and worth the visit. The site has been totally overhauled — it’s easier to navigate, features more useful content and is built to look slick, whether you’re surfing Dos on your deskop, iPad or smart phone.